I do not know what it is about the combination of sweet potatoes and black beans, but I loved it! I tried this recipe a couple months ago and am just getting around to posting it so here goes nothing. This recipe is so easy and every bite is a party in your mouth. If you're a skeptic about sweet potatoes in a taco you just need to try it and you'll be hooked. I promise. 1. Preheat the oven to 425 degrees F. Combine sweet potato cubes with 2 Tbsp. olive oil. Season chopped sweet potatoes with paprika, salt, pepper, cumin, onion and garlic powder. Spread on a baking sheet and bake for 30-35 minutes or until toasted and tender. 2. While potatoes are cooking, combine sour cream, lime juice and zest and salt, whisking well to combine. Set aside. 3. 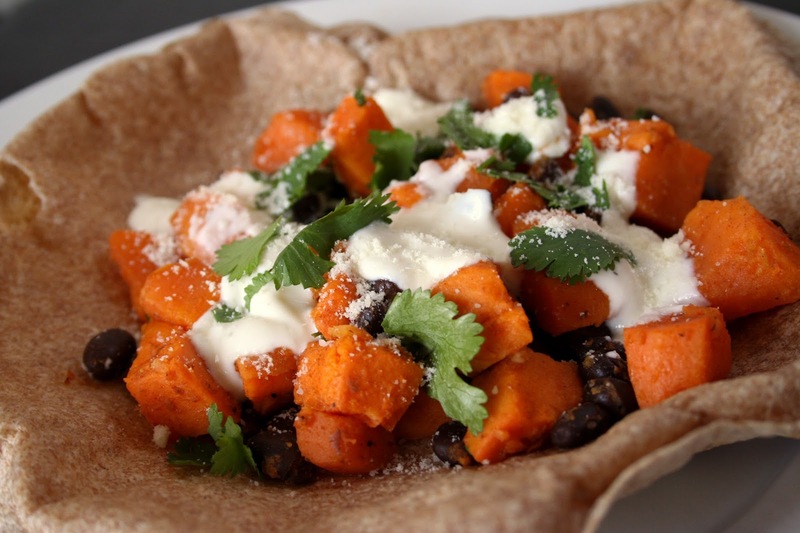 Heat tortillas and serve sweet potato with black beans in a tortilla topped with cheese, cream sauce and cilantro. I'm drooling! that sounds so good!